Life is a bowl of cherries. . . and Rum! If you're like me, when cherries come into season you grab them by the truckload. This means you're eating cherries, cooking with cherries and you're chilling with cherries at happy hour. This daiquiri recipe makes great use of cherries, from the fresh cherries right down to the Maraschino Liqueur and Luxardo cherry syrup. 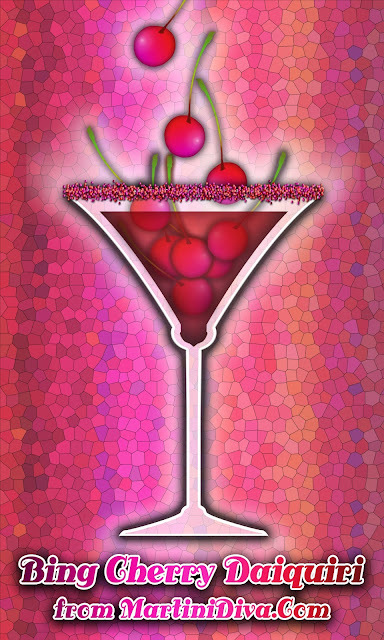 It's a cherry fest of a cocktail. It's also good for you because fresh cherries bring those good guys, antioxidants, to the party as well as anthocyanin (produces the red pigmentation) which studies have shown aids in reducing pain and inflammation. Some proponents have even said eating cherries reduces the risk of diabetes and heart disease. All I know is they're my favorite fruit and they taste wonderful. Muddle the cherries, lime juice and cherry syrup in the bottom of the cocktail shaker. Fill shaker with ice. 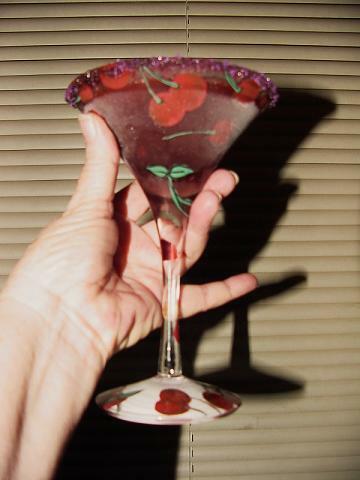 Add the Luxardo Maraschino Liqueur and rum. Shake until chilled then strain into the chilled glass, garnish and serve. I liked it so much I did it two nights in a row.